State Assemblywoman Annette Robinson said she won’t seek re-election this fall, according to reports. 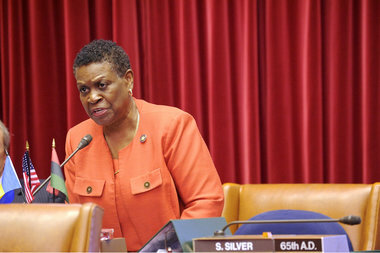 BEDFORD-STUYVESANT — State Assemblywoman Annette Robinson, who represents the 56th District in parts of Bedford-Stuyvesant and northern Crown Heights, won’t seek re-election this fall, according to reports. During a Saturday meeting of the Vanguard Independent Democratic Association, Robinson, who was elected to the district in 2002, also voiced her support for Brooklyn Community Board 3’s chairwoman Tremaine Wright as her successor, Kings County Politics first reported. Wright, the former owner of Bed-Stuy coffee shop Common Grounds, is expected to run against community activist Karen Cherry. In a statement, Wright said the 56th Assembly District has “been lucky” to have Robinson as their advocate. “She has worked and continues to work tirelessly to ensure that resources are allocated for this community,” she said. Robinson could not immediately be reached for comment. Wright grew up in Bed-Stuy and pursued a career in law, also serving on the community board for more than a decade. In 2007, she opened up local coffee shop Common Grounds. The café and community space recently closed as the owner geared up for her Assembly run. Also vying for Robinson’s seat is Cherry, activist and current community liaison for Assemblyman Erik Dilan. Cherry, who lived in the neighborhood’s Tompkins Houses, served as director of community relations and senior citizen affairs for former Congressman Ed Towns, and said she is excited at the opportunity to run for the position. “I just want to be as great as she was,” Cherry said, adding that she has a “vision for every aspect of the district and every age. The state Assembly primary election is Sept. 13.